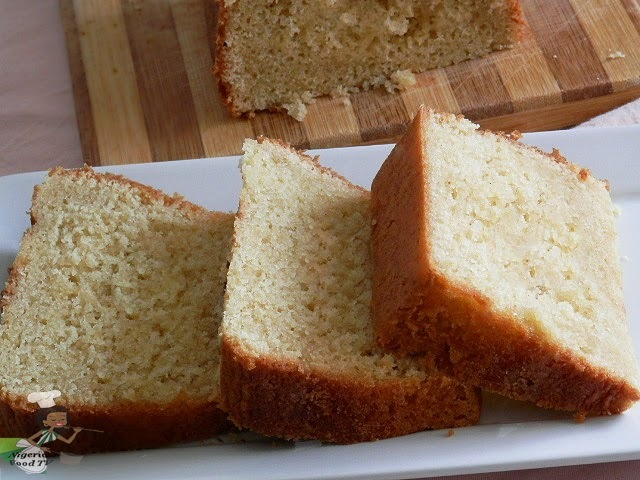 I bet you’ll agree with me that with hundreds of delicious cake recipes out there, it is almost impossible to have just ONE favorite cake recipe. And even when you thought you have finally found your ”go-to” recipe, you suddenly discover another one that also becomes a keeper. That was exactly what happened to me when I came across this Orange juice cake(orange cake). 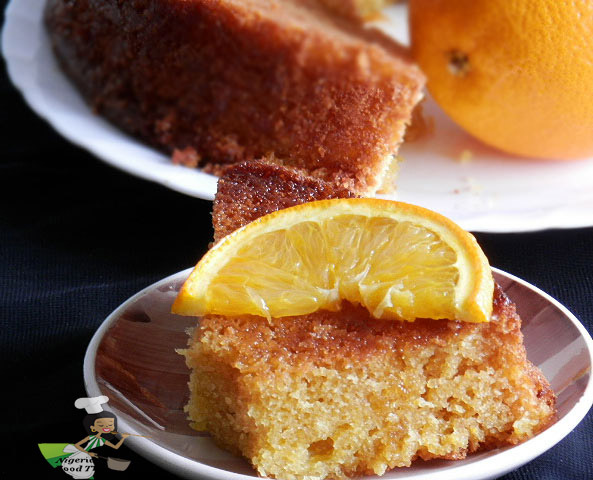 I found myself repeating it so often that, as the aromatic smell of the orange cake filled the house, I wondered what took me so long in sharing this recipe with you. 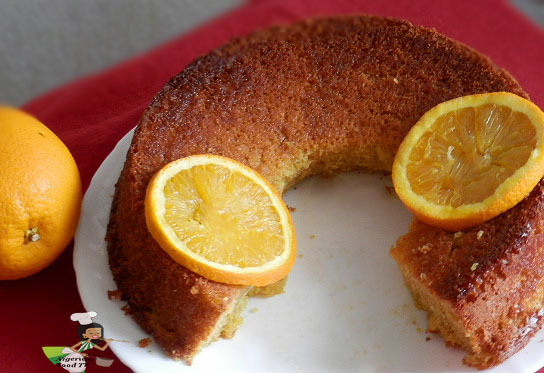 Well, no more delays, here’s my favorite Orange juice cake recipe, and hope you enjoy it. a. You can replace one of the eggs with plain yogurt, if you want to give it an extra boost. b. 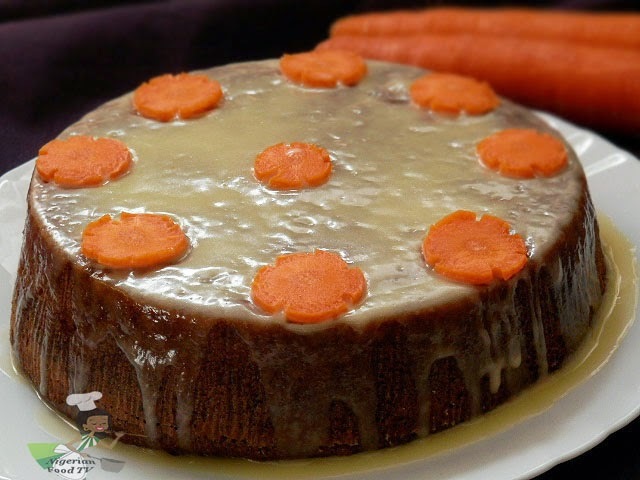 The orange juice syrup is optional but makes the cake really moist. 1. Preheat the oven to 180º C and grease the cake pan lightly with butter and dust with flour. 2. Beat the softened butter and sugar together until creamy. 3. Now add the eggs, one at a time. Then add the orange juice and milk. Mix together and add the orange peel. 4. Gradually sift in the flour and baking powder and mix together until well incorporated. 5. Pour the mixture into the prepared cake pan and bake in the preheated oven for 35 to 45 minutes or until a toothpick dipped into the cake, comes out clean. Tip: the dipper the cake pan the longer it will take to be done. Take the cake out of the oven, leave to cool for 5 minutes, then turn over onto a rack and go ahead and prepare the orange juice syrup. 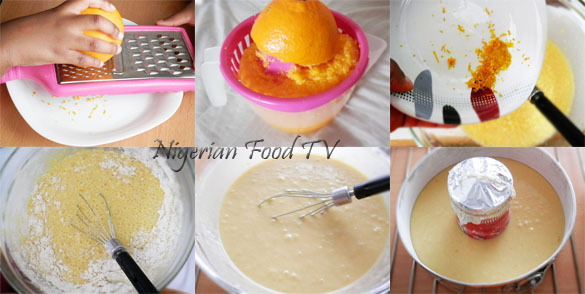 Mix the water, orange juice and sugar in a saucepan. Heat up on low heat, stirring until the sugar dissolves. Simmer for 3 minutes and put off the heat. Finally poke the top of the cake with a tooth pick and pour the hot syrup over the hot cake. Leave to sit on the table for 20 minutes (so that the cake can absorb the orange syrup and cool completely). When the cake cools, gently remove the can and what you have is a tubed shaped cake….Easy Right? My swt Nky, ur d bst. I fully trust all ur recipes nd dis wil b the bomb. Pls can i use d normal tablespoon to measure d baking powder nd since d cake top is usually thick whn done, do i use thookpick 2 poke all over d top of d cake so dat d syrup can go into d cake? Thanks. Hi hun, where have you been all these weeks, I no see your breaklight..lol..Yes dear, you can use the normal tablespoon but always level it with a knife and yes you can poke the cake gently so that the syrup can get in. I made my orange cake on saturday and it was amazing. Thanks a lot. Thanks so much Nky for all your easy and lovely recipes. I've tried a number of them and they were wow.I'd like to know if green oranges would do for the zest ie the grated orange peel. You're welcome hun. And yes you can use the green orange zest. Thanks Nky for all your lovely recipes. I've tried a number of them, and they've always turned out wow. I'd like to know if green oranges would do for the zest ie the grated peel. Thank you. Thank you very much Nky. I have been fantasizing abt this recipe and wat it wud look and taste like but now I can confidently try it out. Hi Nky u r too much joooor. U can't imagine how much I admire u. I have a question, can't dis b prepared in a sandwich toaster? Continue ur great work dear, God bless u for me. I made it yesterday with my sandwich maker, so it is possible. But I made the batter thicker by adding only 30ml milk.Thanks for the recipe Nky, you are the best.